Max Burnet's Private Computer Museum | OhGizmo! I can’t think of a better way to waste a Monday morning than by clicking your way through an online gallery of classic computers. Particularly if it happens to be the collection of Max Burnet, which is considered to be the largest private computer museum in Australia. 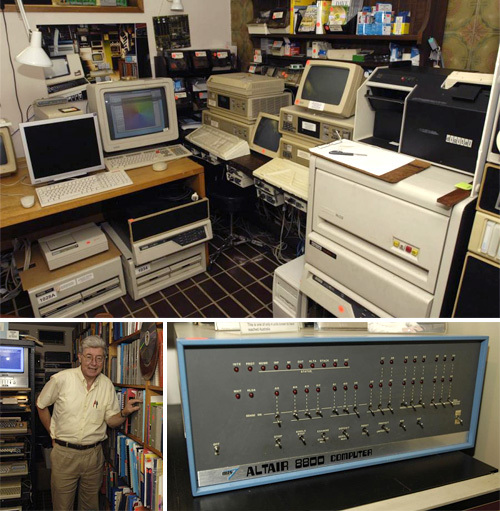 Burnet is now retired, but he worked as the director of Digital Equipment Corporation (before it was acquired by Compaq who later merged with HP) which explains how he was able to fill his 2 story suburban Sydney home with a vast collection of classic computers including everything from the first UNIX PDP-7 to a MITS Altair 8800. Thankfully for us, he let CIO stop by and photograph his collection, and they’ve posted a slideshow with 52 zoomable images for your geeky gawking pleasure.